Are there any other songs of hers do you like? There's one or two more songs on the LP that I like; the rest I find to be fairly uinteresting easy listening. It's so 'Ghost World' don't you think? That's not to say I didn't like the film, or it's soundtrack. I did. I enjoyed the original comic more though. 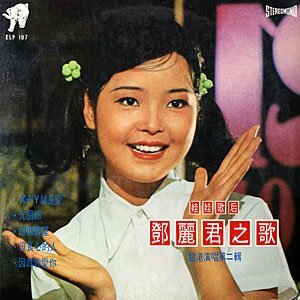 Actually, this song is pretty unknown to what most people know of Teresa Teng today (meaning all of her Polydor HK and Japan songs). This song is called, "Ah Li Shan de Gu Niang - Girl of Ah Li Shan". I think there are a few other recordings of the song available but this one I've never heard before (a lot slower than the one I know of). Anyway, a lot of these pre-Polydor songs under the Malaysian Life Records label are truly amazing songs and lets you listen to Teresa when a more darker and robust voice rather than the sweet and quiet voice that we all know. Meng is right. Even the generation that heard this song recorded in the late 60's when Teresa was still a teen might not have kept this record for so long. Teresa joined Life Records, Hong Kong, in 1972. She recorded some numbers written by songwriters of Life Records, Malaysia. It was during this time that I obtained an autographed photo of hers. I was just a teenager, then. When she joined Polydor, Japan, in 1973 she was given intensive training to perfect her performing skills in singing, dancing and speaking in Japanese. The result is the Teresa that we know today. Most of her fans know her for her signature tunes like "When will you return?" and "Fragrance of the night" but the older generation would remember her for her more playful numbers like "Beloved horse carriage" and "Come marketing with me."